At the center of Jonathan Lethem’s superb new novel stand two extraordinary women: Rose Zimmer, the aptly nicknamed Red Queen of Sunnyside, Queens, is an unreconstructed Communist who savages neighbors, family, and political comrades with the ferocity of her personality and the absolutism of her beliefs. Her precocious and willful daughter, Miriam, equally passionate in her activism, flees Rose’s influence to embrace the dawning counterculture of Greenwich Village. These women cast spells over the men in their lives: Rose’s aristocratic German Jewish husband, Albert; her cousin, the feckless chess hustler Lenny Angrush; Cicero Lookins, the brilliant son of her black cop lover; Miriam’s (slightly fraudulent) Irish folksinging husband, Tommy Gogan; their bewildered son, Sergius. Flawed and idealistic, Lethem’s characters struggle to inhabit the utopian dream in an America where radicalism is viewed with bemusement, hostility, or indifference. Lethem’s characters may pursue their fates within History with a capital H, but his novel is—at its mesmerizing, beating heart—about love. JONATHAN LETHEM is the "New York Times" bestselling author of nine novels, including "Chronic City," "The Fortress of Solitude," and "Motherless Brooklyn," and of the nonfiction collection "The Ecstasy of Influence," a National Book Critics Circle Award finalist. A recipient of the MacArthur Fellowship and winner of the National Book Critics Circle Award for Fiction, Lethem's work has appeared in "The New Yorker," "Harper's Magazine," "Rolling Stone," "Esquire," and "The New York Times," among other publications. Jonathan Lethem's "The Ecstasy of Influence," "Chronic City," "You Don't Love Me Yet," "The Disappointment Artist," "Men and Cartoons," "The Fortress of Solitude," "Motherless Brooklyn," "Girl in Landscape," and "As She Climbed Across the Table" are available in Vintage paperback. "Claiming to have lost my reviewer's copy of Jonathan Lethem's Dissident Gardens, I asked his publicist at Doubleday to send a couple more galleys my way...I wanted the additional copies so I could press them into the hands of close family and dear friends, telling them as I did so: 'Here, read the year's best novel.'" "While collective memory might offer some hazy grasp of McCarthyism and the Hollywood black-lists, all but forgotten is the real American Communist Party and its Depression-era heyday. In this epic and complex new novel, Lethem considers what happened to the ACP, as well as some other questions, about material isolation and filial resentment...The cast makes for a heady, swirly mix of fascinating, lonely people. Lethem's writing, as always, packs a witty punch. The epoch each character inhabits is artfully etched and the book is as illuminating of 20th-century American history as it is of the human burden of overcoming alienation." "[A] stunning new novel...Spanning several major events -- from 1930s McCarthyism through the recent Occupy Wall Street movement -- and featuring an imaginative nonlinear time sequence so that the novel's particulars arrive at unexpected moments, this work is a moving, hilarious satire of American ideology and utopian dreams...Lethem enthusiasts may find this to be his best yet. Very highly recommended." "A dysfunctional family embodies a dysfunctional epoch, as the novelist continues his ambitious journey through decades, generations and the boroughs of New York...The setup of this novel is so frequently funny that it reads like homage to classic Philip Roth." "[This] novel's powerful and polarizing cultural, political, and racial energies are animated by a typically Lethem-esque cast of zanies, communalists, sexual adventurers, innocents, druggies, dreamers, and do-gooders -- cosmopolitans all -- whose lives collide and clash with gut-busting humor, heart, and hubris, which Lethem delivers in his seductively vertiginous prose." "In the past two decades, Jonathan Lethem has written, co-authored or edited 23 books, picking up a MacArthur 'genius' grant along the way. He shows no signs of flagging in his rich ninth novel, Dissident Gardens, an evocative, deeply sympathetic work about three generations of New Yorkers caught up in personal and global politics...It's also no small thing that this famously Brooklynite author has brought to life some of the neglected borough of Queens -- and so much life, so artfully, persuasively created. When a book pulls me for so long into a beautifully made world, there's always a strange sensation upon the last page: I feel the air yanked from me in a sigh for endings and a whoosh of wow." 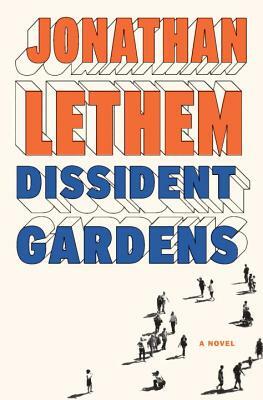 "Jonathan Lethem's latest novel, Dissident Gardens, is a tour de force, a brilliant, satiric journey through America's dissident history from 1930s-era communism to today's Occupy movement." "[Dissident Gardens] is a real tragedy of errors, the characters all destined, like their ideals, for failure. But their vessel, a true novel of ideas, soars, like Sputnik, against all odds."